I’m adding another wonderful story to the Perfect Picture Book resource list that author Susanna Leonard Hill is building on her blog. For more wonderful reviews from authors, educators and others who contributed today, please go here. Please let me share some good news first! Starting now, the price of the Kindle Edition of Show Me How! will be ONLY $2.99 for the ENTIRE SUMMER. I wanted to make it more available to parents, teachers, VBS, summer playground groups and homeschooling families. This is a SUBSTANTIAL discount off the regular $9.99 price. The activities (100 crafts and 100 recipes and 100 picture book summaries) will definitely help provide fun and educational projects for the kids. In the spotlight today is another one of the treasures I scooped up in Singapore at the Asian Festival of Children’s Content. Ella, a young elephant is so scared by hunters that she becomes invisible, except if she likes and trusts you. She seeks help from a little girl named Emma. 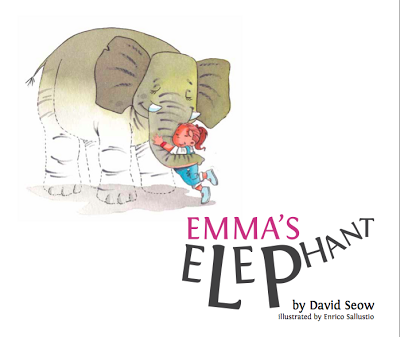 Emma joins the elephant on a journey to see if they can make the jungle a safer place for all of the animals. 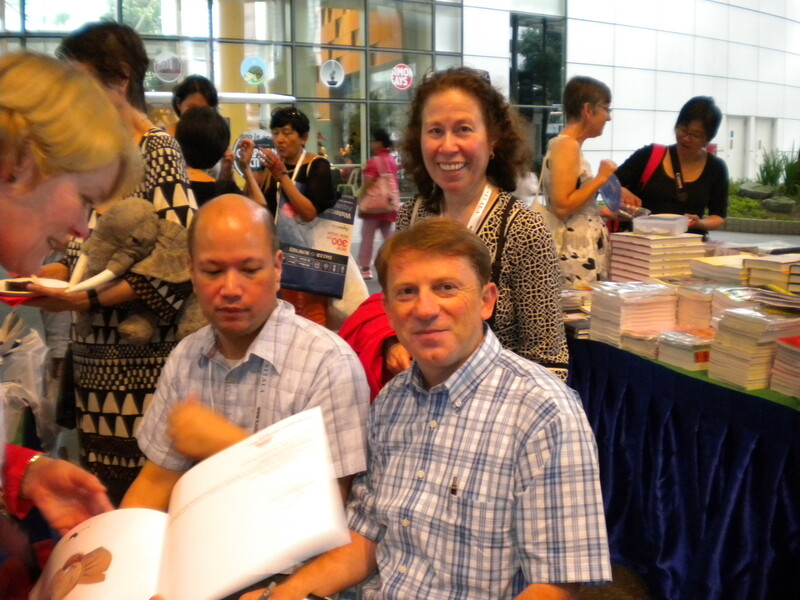 I attended the book launch for Emma’s Elephant at the 2013 Asian Festival of Children’s Content in Singapore and had a chance to chat with the author, David Seow, and the illustrator, Enrico Sallustio. They both signed my copy of Emma’s Elephant (which I will be giving to my new grand-daughter, Sophie) and it was a pleasure to chat with this talented multi-published duo. David Seow on the left, Enrico Sallustio on the right and happy me behind them. Talk about how Ella reacted when she was afraid…how do you feel when you are afraid? What do you do? If you make the craft, your child can role play with her elephant. I love simple crafts for kids. Paper plates are inexpensive and easy to work with. This one is painted…but you can use markers or crayons. Cut pieces of construction paper or material scraps for the legs, trunk, tail, ear and eye and glue in place. Just a few minutes of your time, participating with your child…that’s all it takes…the long-term rewards are amazing! You can connect with the author and illustrator. This entry was posted in 2013 Asian Festival of Children's Content, Crafting with Kids, Perfect Picture Book Friday, Picture Book Review and tagged #2013AFCC, author David Seow, Emma's Elephant, Illustrator Enrico Sallustio, Paper Plate Elephant Craft, Perfect Picture Book Friiday, picture book review, Singapore by viviankirkfield. Bookmark the permalink. the illustrations are super cute! But I love books with a message. Will look for this one at the library. Thanks for sharing! Sounds like a gem. The illustrations sound gorgeous! Is the elephant an imaginary friend? How did you get all your books home from Singapore? What an adorable book and a great activity to go along with it. I suppose an elephant crafted in white could be considered invisible too! Adorable, Vivian! Great deak on your book too. Thank you. Glad you liked the book, Catherine! And I’m hoping the low price will encourage lots of folks to grab one…and find out how much fun and how easy it is to spend time with their kids. :) Especially with the summer…need lots of activities, right? Nice book! I like it! Such a great idea! Like Ms. Tilton I thought the elephant was imaginary. The story is even better that it is not! 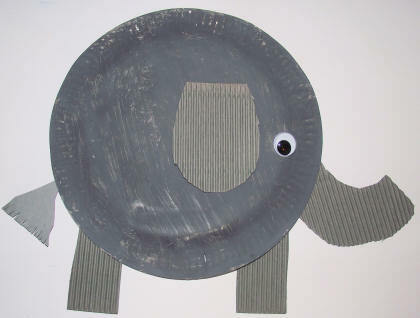 I like your elephant craft idea! I’m sure you have plans for the summer…camp? lots of books to read? trip with family? We go camping in July and I have TONS of books to read! I want to read the entire story now – very cute. You returned with so many treasures! I don’t know if I’ll be able to find this title, but I look forward to it. So inventive! Thanks.